Almost two months ago Sally at The Studio Sublime offered up a bit of a challenge. Using Pantone's colors for Spring, she made several sets of her ceramic beads to match the Spring palette. I believe there were two of each of the ten colors and then an extra two of the Tangerine Tango, since it's the color for the year. 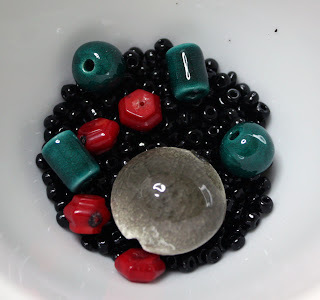 She offered up the lentil beads in her shop and included four other beads in a surprise color of her choice. She called it the Colors of Spring Blog Hop. By the time I heard about the challenge, the colors left were few. I opted for Driftwood. It's a grey with a touch of brown to it. However, I had no idea what color Sally would pair with it. 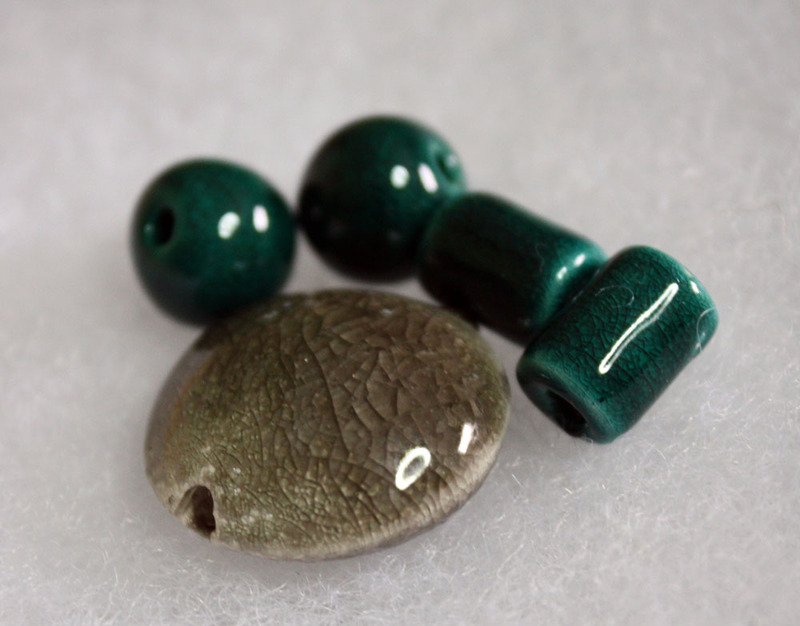 Here are the beautiful beads I received. 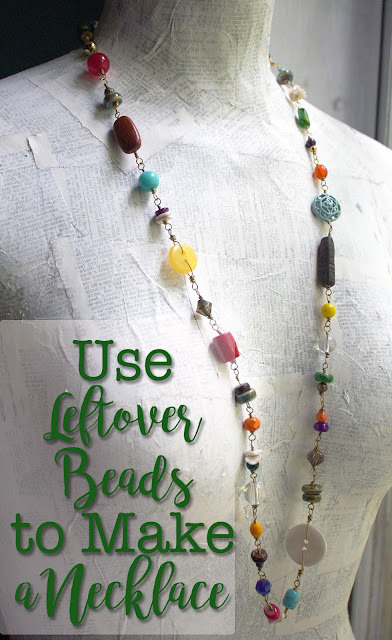 From the beginning, Sally said that it wasn't necessary to use the additional beads just as long as the lentil bead in the Spring color was included. I, however, was determined to use both colors. I pondered the yummy green with the driftwood for a while trying to decide what other shades would go with them. I ended up pulling out bead after bead and comparing them to the ones Sally sent me. I finally settled on a bright red and black. Let me say that I really worked to make sure those shades didn't look too Christmas-y together. I had decided that I wanted to frame the lentil bead in some way and the more I pondered this the more I knew that I wanted that lentil to SPIN also. In fact, I believe I dreamed that part of the design. 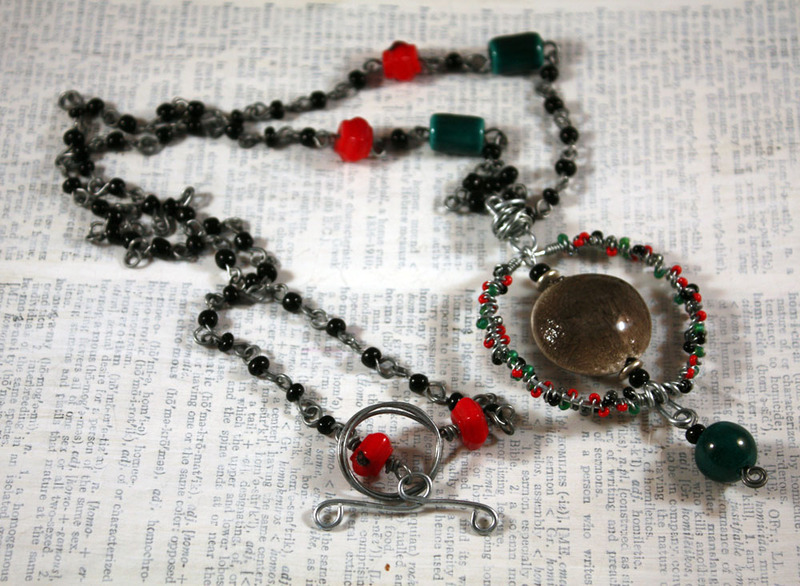 I'm a rather fidgety person and often play with the jewelry I'm wearing, so a necklace that I can spin sounded like a lot of fun. 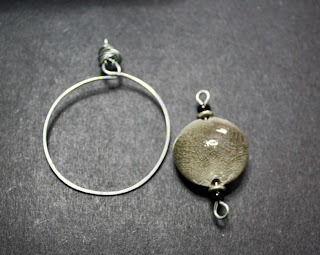 After going through my wire I decided to use some galvanized steel that would almost reflect the gray of the bead while still highlighting the unique shade of it. I started by building the frame and arranging beads on a length of wire with the lentil that would help ensure that the lentil spun smoothly. This was much harder than I thought. I finally found that silver discs at either end worked perfectly. After that, it was a matter of making the chain with the rest of the beads and decorating the frame with similar-colored seed beads. I also made a toggle clasp with the steel wire. Here are my final results. It's really long so I can lift the focal to spin it! And here's a quick video of it spinning! I'll admit that it spins much better when I can use both hands and don't have to hold the camera in one of them. Thanks to Sally for coming up with this challenge. It was a lot of fun. Now, I'm anxious to check out everyone else's colors and what they made. You should do the same! Here's the list of the other participants and their colors! That's lovely Hope and the pop of red lifts it beautifully. I LOVE your necklace, Hope. I love jewelry that has a spinner, or some part the moves! And, your colors worked out great, not Christmasy at all. Great looking necklace. I love the way you make the focal spin. What a great piece! Oh, I would get it trouble with this one because I fidget with my jewelry too. I love the colors,the design, and that fantastic clasp! Well done! Your necklace is so neat I love how you made he pendant so that the lentil bead can spin around very cool. You did a great job at not letting the colors look like Christmas colors. The total look of your necklace is beautiful. What an amazing piece! I love the movement. As always, your work is wonderful! Love the Spin!!! Love it (and the demo)! This is fantastic! The colors work so well and the necklace is fun...I would spin all day long! Hope!! I love kinetic jewelry! 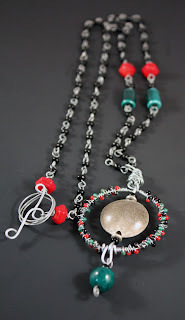 The way it spins in the center of it's own little circle is great and how the tiny beads that you wire wrapped around the circle, the little pops of red are the perfect accent! Thank you for participating in the hop and creating such a inspiring necklace that sets my own creativity spinning!!! I love the way the lentil spins and the pop of red is fantastic, very cool design. Beautiful!! I love that it spins - so perfect! The colors don't look Christmas-y at all. And, the way your framed the lentil is stunning!! very pretty! i love that it spins I love jewelry i can play with. What a beautiful necklace, Hope! I love how you framed the lentil bead! Very lovely! HOPE! I love it!! It is such a beautifully crafted piece! The addition of movement is just fabulous, and I love how you constructed it! I also love the colors you chose- the red is a great pop of color! And how cute are you with the video?! I enjoyed that! You are awesome, girl! Sandi- I'm so glad you like the spin and the red. Thanks for stopping in!! Shel- Whew! I'm so glad I dodged that Christmas bullet with my color choices, but you should have seen just the green and red together. . .disasterous! I'm pleased that you like what I did. Donna- Thanks so very much!! I'm just relieved it worked out. Thanks for hopping by. I am having a hard time picking out my favorite part of the necklace! I mean, the colors are awesome (LOVE that pop of red), the spin of the lentil...awesome! However, my favorite part is how you framed the lentil with those tiny beads! I LOVE IT!!! I love the red too!! 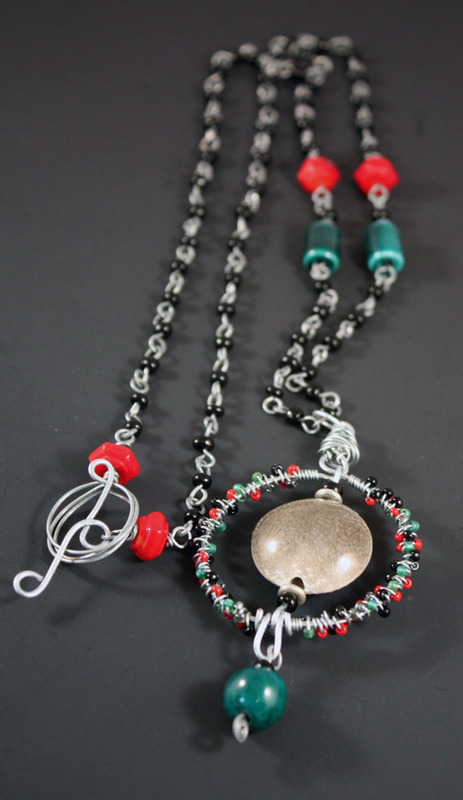 I also like the beaded wirework around the focal!! Unique and fun! Hope, what a clever and pretty design! I love how it all came together! I love it! I love that it spins - your design is incredible! Hope, those would have been hard colors for me to work with - you did a fantastic job! I think you had the hardest colour combos to work with. Hard to work with because it is difficult to not make it look too much like a Christmas necklace. But you did it! Cilla- I don't know if it was the HARDEST, but the green beads were definitely a challenge. I really enjoyed working with Sally's beads and do love a challenge. I'm glad I was able to make something that I really love in the end. Thanks! Patti- I have a hard time picking out my favorite part too!! I'm so glad you like it. Thank you! Lisa- I'm pleased that you like the video AND my necklace. Thank you for stopping by and letting me know! Kristi- The red really did work out well. Thanks for your support of my choice! What a unique design! It takes playing with your jewelry to a whole new level! Love it! Yay, you! 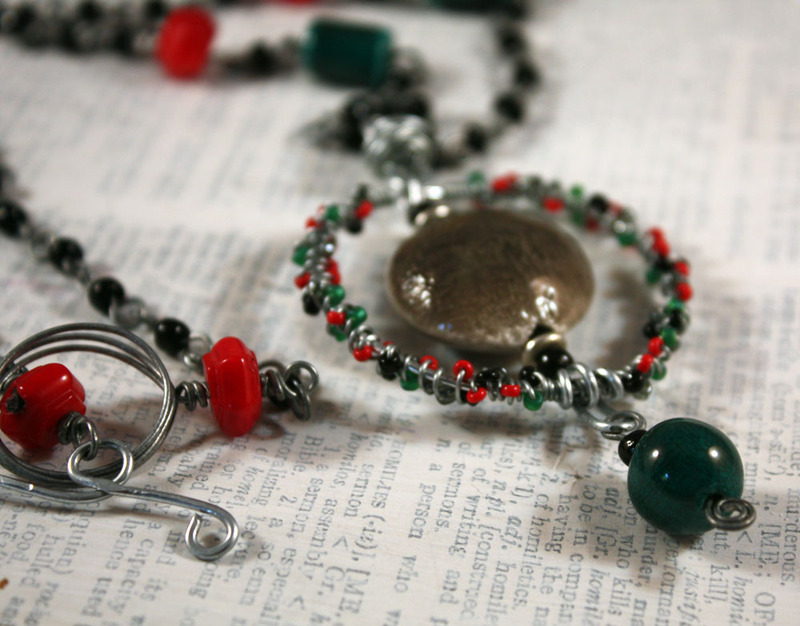 Color and movement and fun, all wrapped up together in a really chic necklace. I'll bet you end up wearing that a lot this summer! So lovely colors. It also would have been clear to me to use all of the beads. And your end result is just wonderful. Congrats!